Creating a software from scratch requires a lot of effort as well as knowledge of the code. Team management along with technological peculiarities must be kept in mind to meet the deadlines for developing a particular software. For Offshore software development, you will have to transfer work to another service provider. You can also say that a service provider gives a part of their development work to another service provider to develop it within the specified time. Starting from app development to web development as well as Linux, Offshore includes everything. So if you are looking for professionals to develop the software for you, then it is always better to contact a reliable service provider rather connecting to a freelancer. You may connect to our developers at Tech Support Dubai for Offshore Software Development services. Our team consists of well-trained developers who are in this field for many years, and they will implement and execute proper codes to develop your software. It reduces costs: As the Offshore companies are located in regions with low cost of living, the cost of developing softwares there are far less compared to the other areas. Sometimes, the companies also provide their best services at no cost for promotion. Qualified developers will develop the software: Offshore software companies are always competent and located in areas where skilled developers are found quickly. There is a pool of talented engineers at Tech Support Dubai, and it is the primary reason why people all over the world connect to us for Offshore development. Easy Scaling: An Offshore software model is always easy to scale as per your requirement. You may require different developers on different stages of a project. A smaller number of developers involved in a project makes it less complicated to mount the project issues. You can save a lot of time which you spend on training your employees: You may use different code languages for which you have to train your employees for months. But availing Offshore development helps you to save a lot of time which you spend on such training sessions. Sometimes, Offshore companies also form a team of expert employees to develop softwares. Offshore companies always have a great skill-set: Since the Offshore companies mainly target a particular technology as well as industry, you can find the best skillset while developing software from an Offshore company. 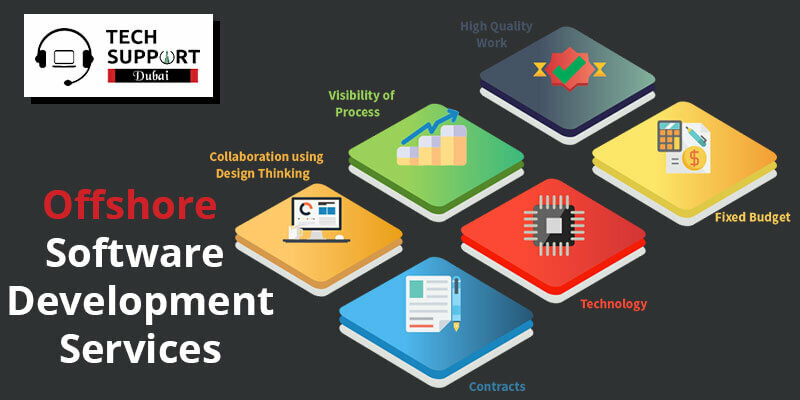 So if you are searching for strong expertise to establish softwares for you, then it is always recommended to go for Offshore software development. Offshore coding is meant for commercial purposes and is utilized extensively. Hence, it is essential to keep a note of the advantageous factors that can affect the software’s performance at any time. We provide our high-quality services at a pocket-friendly rate without affecting your budget. Our team of trained professionals at Tech Support Dubai looks after the different codes used in developing. We offer timely services, and therefore, we try to develop advanced Offshore softwares within a limited amount of time. Also, we make sure that we deliver your developed software within the specified time-limit. So, you can easily depend on our team for efficient services. Our service charges are also reasonable which will always suit your budget. Our technicians have gained in-depth knowledge and experience in creating flawless software with flexible codes. If you are looking for affordable Offshore software development services in Dubai, place us a call at our helpline number: 042053349 and directly get in touch with our professionals. At Tech Support Dubai, our experts will provide you with a unique Offshore software built with flexible codes. We also have a live chat portal where you can directly chat with our professionals regarding any software development issues. You can also email us on our official email ID. Our experts will give a reply within 24 hours and enhance your experience with amazing Offshore software development strategies.